Summer in DC is a lovely and beautiful affair, with the natural scenery providing an excellent backdrop for all sorts of outdoor activities. In particular, summertime in DC is perfect for swimming. There’s no better way to beat the heat than to take a dip in a cool, refreshing pool. Francis DC Public Pool is a reliable, go-to spot for outdoor summer swimming in the DC area. The facilities boast 3 pools of different sizes and depths, which are suitable for varying degrees of swimming skills. There are plenty of lounge chairs for soaking up the sun, and also a kiddie section for smaller children. They also host various activities and classes as well. Pro-Tip: Trader Joe’s is located nearby these pools, so stop by if you’re hankering for some healthy treats or snacks to curb that “after-swimming” hunger feeling. Washington, DC at N Albemarle St.
Woodrow Wilson Aquatic Pools is DC’s premier facility when it comes to indoor swimming. The main feature is a huge, 50 meter multi-lane swimming pool that’s perfect for laps and personal training. There’s also a kiddie pool, as well as a hot tub section. The water levels, temperature, and chlorine levels are always expertly maintained for ideal swimming conditions, and the staff is super-friendly as well. Best of all, the facilities are free to use for DC residents! 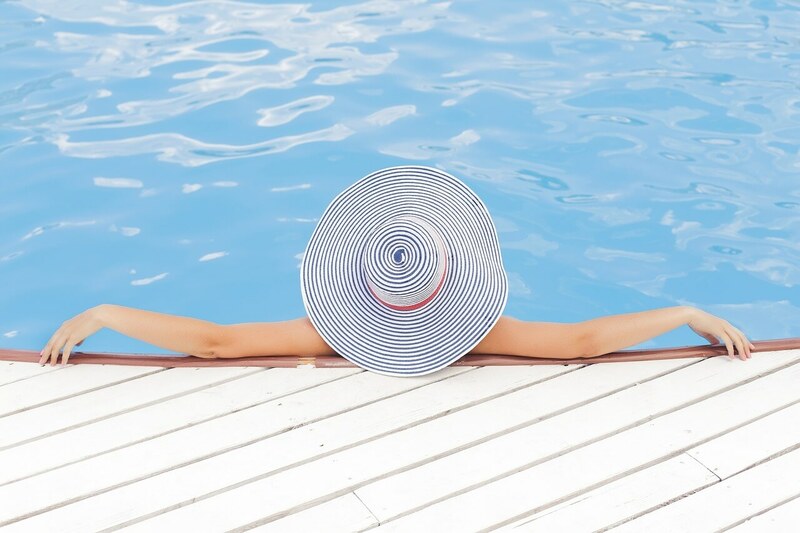 Woodrow Wilson Aquatic Pools is conveniently located less than a mile away from 5333 Connecticut Avenue Apartments. For outdoor pool events and parties, check out the super classy Penthouse Pool Club. This venue is ideal for private events or for a quick, refreshing stopover. They also have 10 cabanas for reserving as well as day bed rentals. You can also enjoy some items from their food menu, and lounge at the pool deck or sun deck. To truly beat the heat and quench your thirst, check out their impressive menu of cocktails and other beverages. This is truly a DC gem! Infinity Pool at 5333 Connecticut Ave.
There’s nothing better than swimming in style in the privacy of your own home. At 5333 Connecticut Ave., our amenities include a state-of-the art, rooftop luxury infinity pool for our residents. Infinity pools represent the ultimate in swimming pool design, aesthetics, and beauty. They have unique edges where the water flows off the edges, creating the impression that the water is blending seamlessly into the sky and surroundings. We also boast a gorgeous pool deck where you can lounge out endlessly. Summertime in DC is one of our favorite times of the year. The possibilities for activities and swimming functions are truly infinite. Are you interested in luxury living in one of DC’s most historic neighborhoods, complete with a rooftop swimming oasis of your own? Contact us today at 5333 Connecticut Ave. Apartments to learn more about specific floor plans, amenities, services, and more!